The area which was later to become the Prestwich Poor Law Union initially formed part of the Manchester Union. Although the union's main workhouse was at Bridge Street in Manchester, the former Blackley workhouse on Moston Lane was converted for as a residential school for pauper boys. 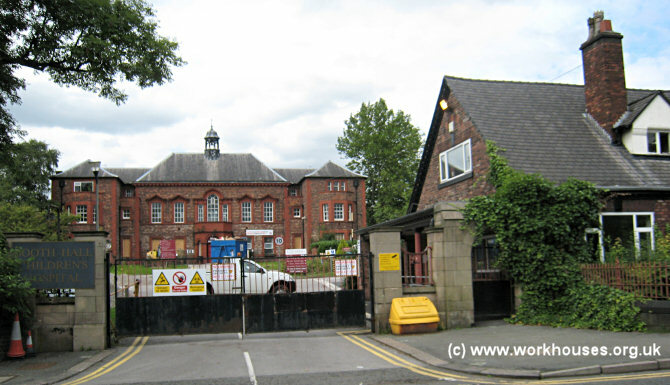 Following the opening of Manchester's Swinton Schools in 1845, the Blackley premises became a silk mill. In a similar way, the old Rainsough workhouse was used as a workhouse school for girls. The large growth in Manchester's population in the 1840s led to the creation of the new Prestwich Union covering the area to the north and east of the city. The new union officially came into existence on 13th February, 1850. Its members (and their number of Guardians if more than one) were: Blackley (2), Bradford, Cheetham (2), Crumpsall, Failsworth (2), Harpurhey, Great Heaton, Little Heaton, Moston, Newton (3), and Prestwich (3). The population of the area covered by the union at the 1841 census had been 28,303, with parishes and townships ranging in size from Great Heaton (159) to Newton (6,127). The average annual poor-rate expenditure for the period 1847-49 had been £2,950 or 2s.1d. per head. Later additions to the union were Beswick (from 1858) and Clayton (from 1894). A pauper inmate attends upon the patients in each ward, neither of them can read writing. The "woman" is told by the porter how to give the medicines, &c. The man states that there is generally a patient in the ward who can read, and he asks him what are the directions on the bottles, &c. Of course there is no security that the right medicine is given to the right patient, or that it is given at the proper time and in the correct quantities. In June 1865, the Prestwich Board of Guardians agreed to erect a new building at Crumpsall to the North of Manchester, on a site adjacent to the Manchester Township workhouse. The corner-stone of the new Crumpsall workhouse was laid on 24th May 1868 by John Taylor, Chairman of the Prestwich Guardians. Intended to accommodate 312 inmates, it was designed by Thomas Worthington who was also the architect of ground-breaking pavilion-plan infirmary for the Chorlton Union. The Prestwich workhouse site location and layout is shown on the 1906 map below. A new workhouse has recently been erected near Manchester for the guardians of the Prestwich Union. The site, which is approached by a road leading from Crumpsall-green to Blackley, forms a part of the Bongs estate, on another portion of which stands the new workhouse belonging to the township of Manchester, so that the property of the Prestwich Board of Guardians is immediately contiguous to that of the Manchester board, and separated by a boundary wall, erected at the joint expense of the two boards. The site of the proposed building being of a very irregular and uneven shape, has involved a great deal of levelling, and a portion of the ground being very hilly, there has necessarily been a considerable amount of excavation. Portions of the building are erected in a valley down to which the ground has been levelled. The approach road, passing through the grounds, sweeps up to the main entrance, passing on the right the farm belonging to the Manchester guardians. The main entrance is in the form of an arched gateway, on the right of which is the porter's lodge, and on the opposite side is his residence. On the first floor are committee and clerks' rooms, adjoining which is a reception room for the accommodation of persons having business with the committee or clerk. Passages to the right and left lead to the probationers' ward, with fumigatories, clothing stores for male and female inmates, together with the usual lavatories, &c. Behind these are wards in which patients suffering from skin disease will be required to remain a certain time before being passed into the house. Passing up the central avenue, we come to a flight of steps leading to an elevated platform in front of the main building, which will serve, as an airing-ground for the use of the aged and infirm of both sexes, as well as the harmless insane. Entering the main building are the master's and matron's parlours, which occupy the central front, the windows of their rooms commanding a view of the front part of the building and airing-ground. A central staircase, exclusively for the use of the officers, leads to the master's and matron's bedrooms, which are placed above their sitting-rooms. On the right and left of the central staircase are large stone staircases for the use of the male and female inmates, and adjoining these are wards for the able-bodied, whose sleeping-rooms occupy a corresponding position on the floor above. There are offices for the master and matron situated behind the main staircase, with projecting windows overlooking the rooms occupied by the able-bodied behind, and so arranged (by a small window looking into the dining-ball on each side) as to give the principal officers in charge a thorough inspection of the whole building. The able-bodied, in passing from the day-room to their separate wards, have to pass by the doors of these offices, thus again bringing them under the supervision of the master and matron. There is a door of separation right and left of the principal staircase for the aged and infirm, whose day-rooms and sleeping-rooms are placed side by side on the same level on each floor. The advantage of this arrangement is that probably more than half of this class who could not dine in the general dining-room may live entirely on the ground floor, whilst the more aged and infirm can live on the same level upstairs. The second door of separation at the further end of this passage leads to the wards appropriated to the epileptic inmates on the ground floor, and those for the harmless insane on the floor above. The room for the attendant is placed so that he can conveniently inspect from his window all the dormitories. Special care has been exercised in the arrangement of the water-closets, lavatories, &c., which are divided by a short ventilated passage from the ward itself, so as to admit of a thorough draught of air through the whole. Projecting behind the main building is the dining hall, with the chapel above, the entrances to which are so arranged as to bring each person under the eye of the master or matron when passing into either of the above-named places. Provision is made for seating about 200 at meals, and this number might be increased if necessary. The kitchen, pantry, bread-store, and other necessary departments are placed behind, and are easy of access to the dining-hall, on the one hand, and to the hospital buildings, on the other, the latter being situated in a group at the back. There is a workshop, on the men's side, with boiler-house, stabling, cart-shed, and coal-shed. On the female aide are washhouses, laundry, foul linen-shoot, bakehouse, coal-shed, &c. At the rear of the domestic offices is a cross corridor, separating the main building from the hospital buildings, which are so placed as to be completely detached from the general workhouse. The hospitals are built on the pavilion principle, there being four pavilions, containing male and female wards, easily accessible to the domestic offices and the surgery. Immediately in front of the kitchen and domestic offices is the convalescent day-room for inmates of both sexes. The wards are two stories high, and have each of them a small scullery, and sleeping-room for the nurse or ward attendant. Each hospital has a hoist, dust-shoot, water-closets, bath-rooms, and lavatories, arranged on a similar principle to those already referred to. Over each water-closet and bath-room is a tank for storing water. One great object of the architect has been to centralise the administrative department as far as practicable, so as to admit of distribution of food, and facility of supervision to those in charge. Another, and perhaps the principal object, has been to give a liberal allowance of cubical air-space, together with sufficient light and ventilation. As one means of accomplishing this, the pavilion principle has, to some extent, been carried out in the arrangements of the main building, or workhorse proper, in which the long, dark, and ill-ventilated passages usually found in such buildings have been substituted by light, airy corridors. Utility rather than appearance having been the aim of the guardians, the building is very simple in design. The architect of the building was Mr. Thos. Worthington, of Manchester; and the general contract was let to Messrs. R. Neill & Sons, for 21,775l. The foundations formed a separate contract, for 3,250l. ; and the cost of fittings, land and purchasing, commission to architect and surveyor, road-making, &c., increased the total amount to 37,775l. 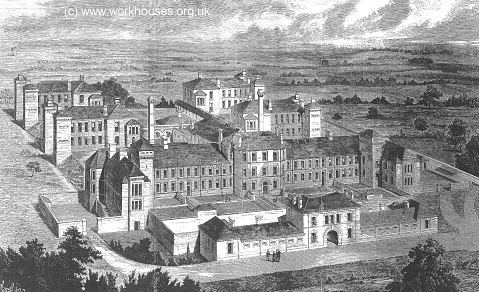 Prestwich workhouse from the north-west, 1872. Prestwich workhouse plan key, 1872. The surviving buildings include the entrance block, another small block formerly in one of the yards at the south, and the labour master's house to the west of the workhouse. 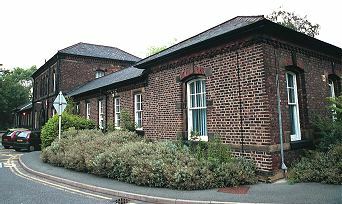 Prestwich workhouse entrance range from the south, 2000. 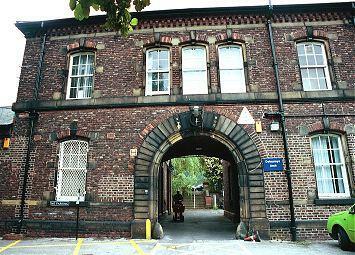 Prestwich workhouse entrance archway, 2000. Prestwich workhouse yard block from north, 2000. Prestwich labour master's house, 2000. From 1904, to protect them from disadvantage in later life, the birth certificates for those born in the workhouse gave its address just as 72 Delaunays Road, Manchester 8. Prestwich Union effectively ceased to exist on 31st March, 1915, when it was amalgamated with the South Manchester (formerly Chorlton) Union and Manchester township to form a new single Manchester Union. In 1918, the former Prestwich workhouse was renamed Delaunay's Road Institution and later became Delaunay's Hospital, which in turn, became part of the North Manchester General Hospital. The entrance block survived until around 2005 but nothing now remains of the workhouse buildings. PRESTWICH.—The Booth Hall Workhouse Infirmary, in Charlestown-road, Blackley, overlooking Boggart Hole Clough, was opened on Wednesday. The site consists of a little over 34 acres of land, and the buildings face south. The administration block is in the centre, and it is designed to serve about 800 beds, the ultimate number for which wards have been laid clown on the plan. At present the number of beds provided is 412. The buildings are of selected common brick, with terracotta dressings. On the easterly side of the administration block the women's wards are located, with a small maternity ward at the extreme end. The men's wards are on the westerly side. Each of these groups consists of three two-storied pavilions, with clay-rooms, centrally situated, each group having also its own entrance or receiving-block. The floors of the wards are in terrazzo and the ceilings are finished in enamel. Bed-lifts communicating with the upper floors have been provided, as well as staircases. Behind the main wards a small isolation ward has been erected. The basement is all faced with white tiles and is utilised as the stores. The buildings are lighted throughout and all the lifts are driven by electricity, which is generated by three sets of Willan and Robinson's engines. The nurses' home is a detached building on the easterly side, and has accommodation for twenty-eight nurses and six probationers. The architects are Messrs. Thomas Worthington and Son, Manchester, and the contractors Messrs. Robert Neill and Sons, Manchester, with Mr. J. Maynard as clerk of the works. Prestwich Booth Hall site, 1909. Prestwich Booth Hall aerial view from the south-west, 1920s. 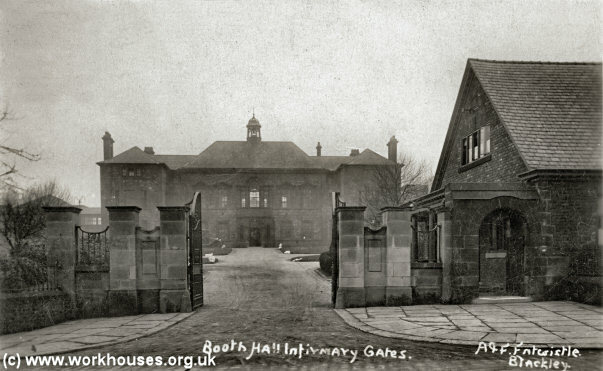 Prestwich Booth Hall entrance, c.1908. 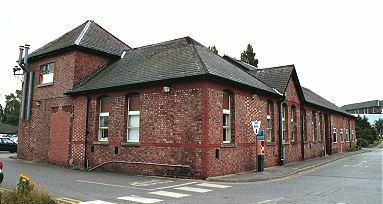 Following the formation of the combined Manchester Union in 1915, Booth Hall was redesignated as a children's hospital. By 1930, expansion of the premises had taken its capacity to 700 beds. In 1927, Princess Mary opened new pavilions at the west of the site which included 200 glass partitioned cubicles each containing a bed that could be opened to the air if required. Prestwich Booth Hall new pavilions, c.1929. The Booth Hall Children's Hospital closed in June 2009 and the site is scheduled for redevelopment. 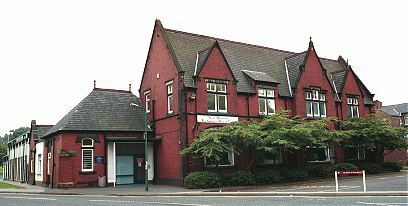 Prestwich Booth Hall entrance, 2009. Greater Manchester County Record Office (with Manchester Archives), Archives+, Manchester Central Library, St Peter's Square, Manchester M2 5PD. The relatively few surviving records include: Year books (1889-1914); Lists of Guardians and officers (1889-1914); etc.